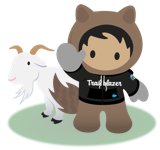 I'm on team Trailhead and part of the amazing Trailblazer Community + T4S group (http://trailblazer.salesforce.com/about). ####Together, we manage and support the online Trailblazer Community, Community Groups, Salesforce MVP program, Student Groups, Trailblazer Community Conferences, and Trailhead for Students. Learn more about our stellar community by earning the Trailblazer Community Groups badge: https://sfdc.co/TCGmodule####I'm also the Global Vice President of Latinoforce, an Ohana Group here at Salesforce (https://sfdc.co/bMQUvA). Sofía Rodriguez Mata hasn't posted any ideas yet.